Never heard of or had any knowledge of this film. Another one of those blank slates going into this. This is an Italian thriller/horror black comedy from 1977. Titled Black Journal. Directed by writer director Mauro Bolognini. 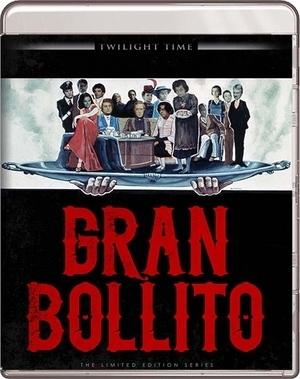 Bolognini created many memorable foreign films. I knew of him going into this, although I have not seen a lot that he has done. I have seen a few such as the 1970’s drama Metello. The awesome crime drama 1972’s Chronicle of a Homicide starring the wonderful Martin Balsam. The best film I think he has ever created, at least of what I saw was 1976’s drama The Inheritance starring the wonderful Anthony Quinn. How I remember him most is directing the movie that my number one director of all time wrote, the very cinematic wonderment of the master of cinema Pier Paolo Pasolini. Bolognini directed 1959’s The Big Heat written by Pasolini. Starring one of my favorite female actresses of all time the one and only Shelley Winters. A goddess of acting and performing in such amazing roles throughout her career both great and small. Winters starred in many of my top films. One of her films is number 6 on my 100 greatest films of all time. That film is 1965’s A Patch of Blue, which is a film that should be seen by any lover of cinema. It is a pivotal film that means so much, and is a prime example of the beauty of what film can be. Who can forget her in the mazing 1977’s Pete’s Dragon. Who can forget her as Ma Kate Barker in 1970’s Bloody Mama. A little trivia for you she played Ma Barker once before in 1966 in the Live Action Batman TV series. Starring the very beautiful Laura Antonelli. Who sadly passed away in 2015, she left a wonderful career of cinema. Mainly an Italian actress. Starring in many pieces. Many might remember her as the character Rosanna in 1966’s Dr. Goldfoot and the Girl Bombs. She was great in 1969’s Devil in the Flesh and 1970’s A Man Called Sledge. My personal favorite film she starred in 1976’s L’innocente. She was a wonderful stunning performer. This also has the amazing one of a kind master of acting, which words can’t describe his flawless talent in cinema, Max von Sydow. Sydow has been in so many amazing films both big and small. His classic work is something to explore for any movie lover. There are movies that he has starred in that any film buff, historian, lover must see to consider themselves real film buffs. Because these movies are cinematic mastery that defines the real nature of the power of film. Max’s work on Ingmar Bergman’s films is what I speak of. There are two films that you must see: The Hour of the Wolf: The Hour of the Wolf, this is one of the most psychological thrillers you will ever see. This is like Bergman's brilliant attempt at a true psychological horror film. The filming of certain moments is so down right odd and freaking beautiful and haunting. There is a personal surreal feel to this film and yet it adds a darker Gothic reality to it. The atmosphere and camera work are flooring. The odd ball spooky moment of walking on the wall and ceiling and so on just add one mind trip after another. It's a film that will leave a lasting image, mark and nightmare with you because of Max’s acting. The next movie is the cinematic masterpiece beyond words The Virgin Spring. Which is in my Top Ten Greatest Films of all time. If you want to know where all the 70's and 80's directors got their idea for such films as The Last House on the Left and so on and so on, then you should look at the original that started this scenario. The Virgin Spring is the true original one-of-a-kind, brutal, amazing drama filled beauty. There's is one shot in The Virgin Spring where Max von Sydow's character is messing around with a tree after finding out the news that destroys him. This cinematography, the landscape, the amazing wonderment that this shot captures is something that's never been accomplished again. Max’s intensity is almost unbelievable. Max is an actor that I speak highly of above and beyond so many other actors. His roles both great and small are always filled with a masterly touch. It was great seeing him in this. Now interesting to note this is based on a real-life event. The serial killer known as Leonarda Cianciulli known as the Soap-Maker of Correggio. She murdered three women and turned their bodies into soap and teacakes. Shelly Winters plays a mother that is very over protected of her son. So, she decides to make a deal with death at least in her mind that instead of her son, she will trade victims for her son’s protection. In real life, she killed three women to protect her son as he was going off to war to train for WW2. The movie as always changes the subject. She in real life thought that to protect him, she had to sacrifice victims. Oh, the love of a mother. Twilight Time chose a very interesting and odd ball film with a mix of black comedy, horror and drama that truly stands out as being very original and unique. Another lovely Blu-ray edition to the collection. Twilight Time always chooses interesting films and this one wins the cake. The movie looks wonderful, this is my first time seeing it so I had no other viewing to compare it to, but what I see is Twilight Time did an amazing job, and this is a worthy to praise transfer to 1080p High Definition. And most of all you get the wonderful booklet insert by film historian Julie Kirgo which is always a huge plus. Another wonderful Special Edition Blu-ray by Twilight Time. A great way to enjoy an odd film, acted wonderfully. Spot on direction in a surreal style. A mix of black comedy with horror and an overwhelming reality of drama. Shelly is amazing and owns the movie. I thought Twilight Time choose a unique film, and I love this choice just because it’s so different, plus I had no knowledge of it. I like to explore films often forgot about, or overlooked and Twilight Time chooses many of these styles of films, and that is why I love them so. Highly recommend.